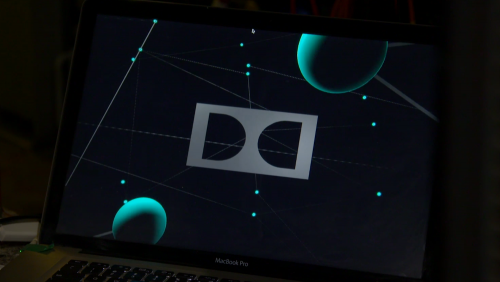 Dolby asked us to make some audio reactive visuals for them especially for their ATMOS DJ events at ministry of sound. 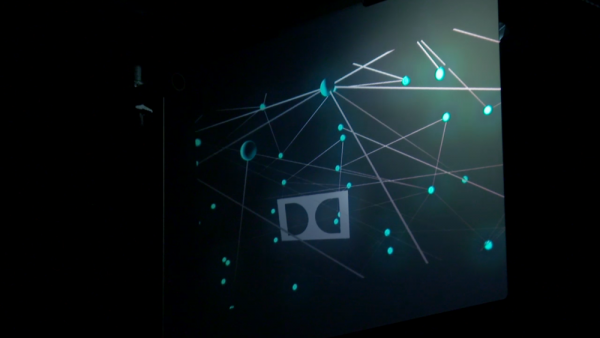 Using the visual programming environment, Vuo, we recreated their logo in 3 dimensions, and created an audio reactive engine to create a technical looking 3d mesh which surrounded the logo on all sounds, and which moved in time to the music. Where there are large enough changes in the music, such as at a breakdown or drop, the camera viewpoint for the scene changes. 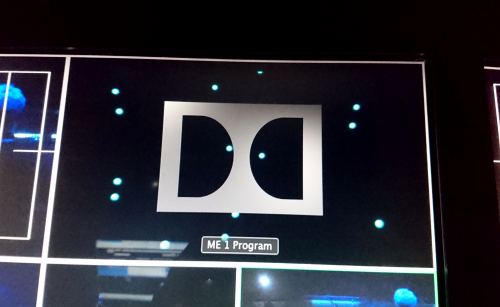 In its resting state, the installation shows just the Dolby logo moving slowly in 3D space, with an almost static network of dots and lines around it. As the music gets more lively, the dots become more agitated and different parts of the visuals move and grow, according to different frequencies in the music. The visual installation runs off one of our dedicated visuals laptops, and takes live stereo audio from the DJ booth to use to create the visuals. Then when a DJ is playing a track in ATMOS, we turn on the audio reactive visuals on the overhead screens to reflect this for the audience in the club. It was important for us to have as many elements of the lighting and video showing the link between the audio that the clubgoers were listening to and to what they were seeing in the visuals and lighting. For this reason, audio reactive visuals which were affected clearly and visibly by the audio being played at the time was the necessary choice.